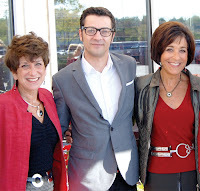 A sell-out crowd was on hand for the Sept. 16th Joseph Ribkoff fall/holiday trunk show, hosted by Susan’s in Covington Plaza. A portion of all ticket proceeds went to Francine’s Friends. Also in attendance was John Ferraro, president of Joseph Ribkoff (center, shown with board members Sharon Eisbart and Irene Walters). And we were thrilled to have Katie Stam, the reigning Miss America, make a special appearance! Susan’s will be doing the survivor makeovers and fashion show portion of our annual October fundraiser "Celebrating 5 Years with Friends" on October 9, 2009. The breakfast will begin at 8am at the Allen County War Memorial Coliseum. 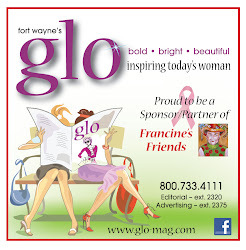 And if you shop after the breakfast during the weekend or on Monday and mention Francine’s Friends, a portion of your total purchase will be donated to Francine’s Friends. Thank you, Susan's!